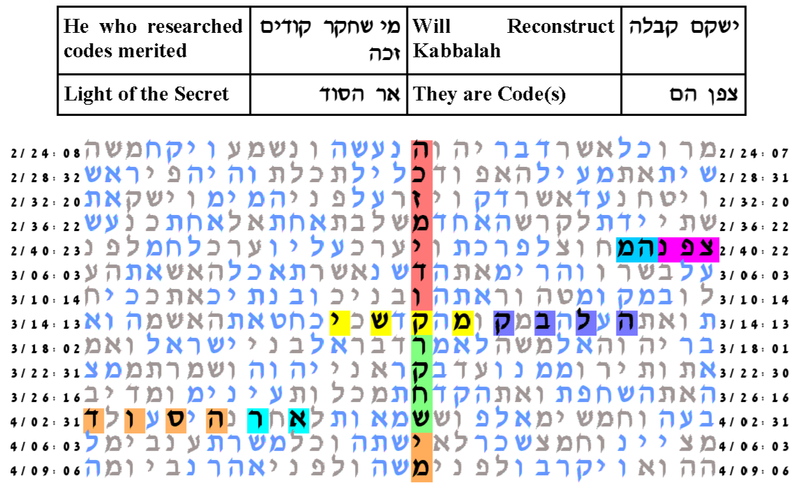 There is an interesting ELS of the key word phrase Reearching Codes around which there are ELSs of related key words: Kabbalah, Code, and Light of the Secret. The cylinder size is 7018. Finding by Professor Rips and Rabbi Glazerson. Some time after the above table was found, it was examined more closely and additional extensions were found. Kabbalah was extended to Reconstruct Kabbalah. Researching Codes was extended to He who researched codes merited. Codes was extended to They are codes.